At T-Plas 2015, Engel Austria will be demonstrating a two-component application to show how high quality can be achieved with low unit costs. An Engel e-victory 200H/80W/120 combi injection molding machine with an Engel viper 20 linear robot will be producing sensor housings for flow metering with an integrated seal. The first stage involves two housings being molded simultaneously from a thermoplastic material. The robot then transfers the parts of the housing to a second set of cavities, where the seal made from liquid silicone (LSR) is molded on directly. While the soft components of one set of housings are being processed, the next housings are already in progress in the lower half of the mold. “Having the seals molded directly onto the housings not only increases production efficiency, but also product safety. The thermoplastic and elastomer form an inseparable unit,” explained Aram Tongurai, Managing Director of the subsidiary Engel Machinery (Thailand) Ltd. The multi-component process is not the only challenge presented by the manufacture of the housing parts here; handling the liquid silicone safely is also difficult, particularly because its low viscosity makes it hard to work with. The processing of liquid silicone rubber (LSR) has to be fully automatic, waste-free, low in burrs and require no post-processing. Engel said it is able to use a standardized servo-electric injection unit for processing of LSR while maintaining high degree of precision. To measure out the liquid silicone, mini pumps with 1L tanks are used that all fit within the safety housing of the injection molding machine, saving both space and costs. With a tie-bar-less clamping unit, Engel’s patented force divider on e-victory enables the moving mold mounting platen to follow the mold exactly while clamping force is building up and ensures that the clamping force is evenly distributed across the platen face. In addition, the Engel viper robot can reach the cavities directly from the side without having to circumvent any obstacles. At the show, Engel will also delicate an exhibition area highlight its e-service.24 and e-factory under the heading Engel plus. 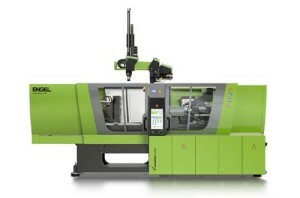 With the current release of MES solution Engel e-factory, it can be connected directly to ERP systems such as SAP – even injection molding machines of different brands can be integrated. This way the operations manager can keep an eye on production figures from his desk in real time and take immediate counter actions in case of deviations. Under the Engel e-service.24 package, Engel service engineers can use a remote connection, after approval by the customer, to access the machine data in real time, and immediately start troubleshooting following an error message. On site specific instructions and explanations can be given by the Engel team through audio, video or text conferencing. T-Plas 2015 will take place in Bangkok, Thailand from August 26-29.